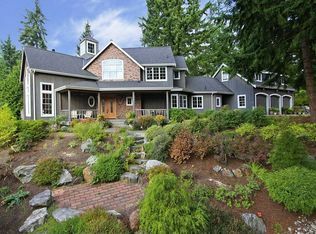 Quintessentially Northwest~Perched atop a private 2.4 acres on Hollywood Hill with a backdrop of evergreens and gardens, this south-facing country estate has the warmth & character of a ski lodge and the grand scale & space of a custom manor house. Abundant natural materials -gleaming hardwoods, slate, marble, wrought iron, river rock & exposed beams bring the outdoors in. Joyous antiqued kitchen hosts the grandest gatherings; 4 ensuite bedrooms + additional living quarters above 3-car garage.